One number to rule them all: Can we agree on the extent of deforestation? Deforestation is one of our key concerns in land use and forestry. Huge political and financial resources are directed toward reducing forest loss and balancing the multiple benefits derived from the world’s landscapes. 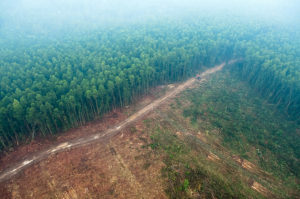 Given the massive attention that deforestation attracts, it is surprising how difficult it can be to answer the seemingly simple question: How many million hectares are deforested every year? I was recently invited to an expert panel organized by the Guardian, titled Forests soak up greenhouse gases, so how do we ensure their protection?. The stated objective of the session is “to discuss the resources needed to fight deforestation”. I think it is great to connect and contribute using modern communication technology instead of traveling to conferences, so I happily accepted. As background* to the event, the Guardian states that “Every year, 18 million hectares of tropical forest – an area the size of England and Wales – are cut down”. While “cut down” is an ambiguous description, the text that follows makes clear that this is in fact the deforestation we are to discuss on the panel. Interestingly, this refers to all forests, not just the tropical forests referred to in the background to today’s event. This is significant, as we will see below. Also note the use of the word “felled”, which again draws an ambiguous link to deforestation. Meanwhile, the word “deforestation” is used eleven times in the text, so there is no doubt that this is the topic in focus. Vidal’s article in turn links to a release by the World Resources Institute (WRI) from September 2015, related to an annual update of Global Forest Watch (GFW) statistics. So the “forest” in John Vidal’s article was originally “tree cover” in the study he referred to. GFW, using UMD data, indeed reports tree cover losses. It is well known among scientists that there can be discrepancies between tree cover data obtained using remote sensing and forest area data as determined through land-use or land-cover assessments — well described by WRI here. We must be careful in comparing datasets with different definitions and concepts — see, for example, my earlier article here. GFW data on tree cover loss should not uncritically be used as a proxy for deforestation. The WRI release also tells us that about half of these tree cover losses (9.9 million hectares in 2014) were in the tropics; the rest occurred in temperate and boreal regions. It turns out that the Guardian’s statement on deforestation is a number that is doubled compared with the source two clicks away, and that this is not a deforestation number in the first place. The Guardian is not alone in this . 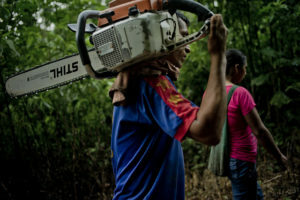 I went through the 15 most recent World Economic Forum blog articles on forestry and found three different numbers used for annual global deforestation — 18, 15 and 5.2 million hectares — none of them corresponding with the 7.6 million quoted in the current Global Forest Resources Assessments (FRA) report from the UN Food and Agriculture Organization (FAO). Many civil society advocates have for decades found it worthwhile to claim that not all forests are forests. Planted forests, in particular, are disqualified in their view. This unwillingness to accept planted forests has hampered a shared understanding of issues, and has led to more complicated negotiations, for example on REDD+. Further, countries often have their own sets of definitions that need to be harmonized to fit international reporting. Finally, and perhaps most frustratingly, international processes and conventions have adopted different definitions, each fiercely defended by the respective bureaucracies. The latter issue has been addressed in a CPF initiative, but progress is slow. Uncertainties and discrepancies also stem from poor measurement data. Remote sensing alone is often assumed to be a universal solution to data shortages, but the information content is shallow, ambiguous and generally incomparable across platforms. Field sampling provides better quality data, but investments in national inventories is expensive and lagging, and precision suffers when observations are few. Deforestation has a problem-oriented focus. The tendency to exaggerate the problem, either in narratives or in quotations of facts, is not uncommon and not ultimately beneficial. Similarly, governments may underreport deforestation for political reasons. In FRA 2000, deforestation in Africa was found to be overestimated by a factor of two. The development of national forest reference levels for REDD+ is another interesting process in this context. While UMD data have provided a long missing standard in remote sensing data, these are not a universal tool and are still evolving. With several academic groups developing proprietary models using different data, we are bound to have substantial discrepancies. In 2012, Winrock International and Woods Hole Research Center reported widely disparate numbers on global emissions from tropical deforestation. In the interest of stability in REDD+ negotiations, the results were later calibrated — a negotiation in itself. There is potential to improve quality in news reporting and in publication of research papers. Better quality research and reporting could help avoid the types of errors mentioned above. Even the World Bank, our leading provider of development indicator statistics, erroneously publishes deforestation data by country, when in reality these are net forest area changes, i.e. the sum of positive and negative (deforestation) trends. We all want to, and must, curb deforestation. With ongoing uncertainty at a global level it will become difficult to know how much progress we are making, or where our successes lie. It would be useful if official institutions, in particular FAO with its mandate in this field, stepped up to work with all stakeholders on forest assessments to build stronger consensus. At the end of the day, we share the objective and mission to reverse deforestation and support forest landscapes that are sustainable, profitable and equitable. In doing so we should make an extra effort to avoid communicating alternative facts. *Edit: Since the publication of this article, the Guardian has updated their background document and now refer to “tree cover” instead of “tropical forest”.